As the use of drones is becoming more and more common, the need to restrict its misuse and ensure mitigation of the risks involved, has also increased. Commercial drones can easily achieve speeds around 10 miles per hour with propellers rotating above 10,000 rpm (Alex & Sam, 2015). No doubt, if not properly handled, these speeds can cause severe injuries. Recently in their well known program, Mythbusters, Adam Savage and Jamie Hyneman carried out experiments to check if drones really can cause flesh wounds. Two commercial drones were used in the experiment. The first one, Quanum Nova with four rotors and a weight of about 10.6 Oz, was used on chicken meat to check if a flesh wound is possible. The other one was a Rotorbits Hexcopter with six rotors and weighing about 13.23 Oz, which was used on a Ballistics Gel Test Dummy to check how a spinning drone blade can damage a neck. Initially, in a test flight with Quanum Nova, Adam Savage accidently hit a tube light, causing it to fall from a height which could cause injuries and thereby, showing that a drone can be dangerous indirectly as well. Chicken meat was mounted on a pole and the motor of Quanum Nova was disassembled and mounted on a stick. The power was turned and the spinning blades were touched to the meat, causing at least half an inch deep flesh wound (io9, 2015). It was thereby proven that, a drone can cause a flesh wound but can it be life threatening? In the second phase, the effect of a spinning blade hitting one’s jugular vein was to be checked. The Rotorbits Hexcopter was flown in to the neck of the test dummy and the results were shot through a slow motion camera. 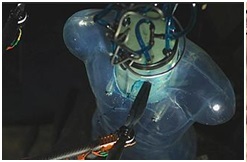 The blade of the drone again penetrated at least half an inch in to the neck of the dummy and caused the gel to gush out of the dummy body (Discovery, 2015). The results are clear enough, a drone can cause serious injuries which can be life threatening if mishandled. But, thanks to the drone manufacturers, most of the drones available these days come with propeller guards and thereby, will not cause any flesh wounds.